Genu recurvatum is a deformity in the knee joint, so that the knee bends backwards. In this deformity, excessive extension occurs in the tibiofemoral joint. Genu recurvatum is also called knee hyperextension and back knee. This deformity is more common in women and people with familial ligamentous laxity. Hyperextension of the knee may be mild, moderate or severe.The development of genu recurvatum may lead to knee pain and knee osteoarthritis. The normal range of motion (ROM) of the knee joint is from 0 to 135 degrees in an adult. Full knee extension should be no more than 10 degrees. 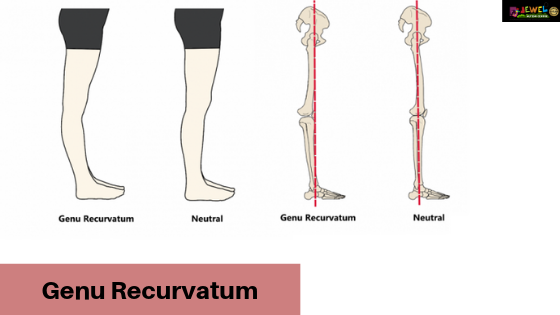 In genu recurvatum (back knee), normal extension is increased. External Rotary Deformity Recurvatum implies an elevated heel with the forefoot pointing inwards and foot remaining in an equinovarus position while walking. Internal Rotary Deformity Recurvatum occurs when the forefoot rotates outwards, forcing the patient to overextend the knee. Non-rotary Deformity Recurvatum implies abnormal positioning of the knee, with foot and ankle functioning normally. Physical Therapy: Initially, the doctor may suggest physical therapy to improve the strength of quadriceps to compensate for the knee hyperextension. This also includes gait-training procedures which help the patient to focus on proper sequencing and maintaining control on the limb. Other therapies include muscle-imbalance correction techniques and proprioceptive training. Orthoses: This provides optimal support to the knee. It protects the knee, stabilizes the leg, and limits abnormal hyperextension of the knee-joint, thereby enabling the patient to move actively and maintain a more harmonious gait pattern. Bracing: Doctors may suggest bracing of the knees to prevent further hyperextension. Surgical Treatment: Although rare, in severe cases, doctors may suggest a Proximal Tibial Osteotomy to decrease knee hyperextension and increase the functioning level of the knee. If left untreated, Genu Recurvatum will continue to strain the knees, damage soft-tissue structure of the knees, and result in increasing joint deformities. It may also lead to other disorders, such as, Genu Valgum, Genu Varum, and Knee Osteoarthritis. Avoid activities that may impose a strain on the knees. Strictly follow the physical therapy program as suggested by the therapist. Since Genu Recurvatum may occur genetically or due to an injury, it is not possible to prevent the occurrence or recurrence of the deformity. However, braces, orthoses, and rehabilitation help in limiting hyperextension of the knee-joint. Francis on Autism diet plan ,what to include what to avoid. Linda on What is ABA Therapy?